Draft: 2011, Los Angeles Angels, 4th rd. Full name MICHAEL ANTHONY CLEVINGER...He and Monica Grace have two daughters, Penelope Grace and Piper Lotus...Attended Wolfson High School in Jacksonville, FL...Attended The Citadel (Southern Conference All-Freshman team in 2010) and Seminole Community College (2011 in Sanford, FL)...Signed by Angels scout Tom Kotchman...Favorite player growing up was Mickey Morandini...Big fan of former pitcher Dock Ellis...2017-18 Tribe Fest participant...Enjoys mountain bike racing, skateboarding, surfing and fishing. Enjoyed a career season, establishing career-bests in every pitching category, eclipsing the 200-strikeout mark and 200.0 innings bench mark as well...With Corey Kluber, became just the fourth duo in the 118-year history of the club to record 200 strikeouts and top the 200.0 inning mark...Recorded his 200th strikeout on Sept. 22 vs. Boston, becoming the fourth member of the club's rotation to do so, establishing a Major League record...Was arguably the best pitcher in the American League in the second half, going 6-3 with a 2.31 ERA in 13 starts after the break (78.0IP, 53H, 20ER, 27BB, 89SO)...Recorded the lowest average against (.189) after the break and was second in ERA, second in on-base pct. allowed (.264) and slugging pct. allowed (.345) and fourth in strikeouts and innings...Recorded a record of 8-1 with a 1.95 ERA in 14 starts vs. A.L. Central opponents (20ER/92.1IP), the lowest ERA in the A.L. vs. Central (min. 60IP)...Recorded six pickoffs, second-most in the A.L. behind Seattle left-hander Marco Gonzales (7; tied for third in MLB behind Atlanta's Julio Tehéran)...Most pickoffs by an Indians pitcher in a single season since 1989...Allowed 18 steals, tied for eighth-most allowed in the league. Enjoyed some outstanding starts, tossing his first career shutout on April 21 at Baltimore (9.0IP, 2H, 0R, 2BB, 3SO)...Marked the fewest such hits in a shutout by an Indians starting pitcher since Carlos Carrasco allowed one hit in a shutout at Kansas City on September 25, 2015 (9.0IP, 2BB, 15K)...Set a career-high with 11 strikeouts, done twice, the last of which came on July 9 vs. Cincinnati (also, June 14 at Chicago-AL)...Recorded his first five double-digit strikeout games of his career...Clevinger posted a 3-0 record and 2.21 ERA (9ER/36.2IP) in six August starts...His 39 punchouts also tied his most in a single month, alongside May and July 2018...Bested that in September, going 3-1 with a 2.12 ERA in five starts (7ER/29.2IP)...From August 30 on he was 4-1 with a 1.73 ERA to end the year (36.1IP, 18H, 7ER, 12BB, 44SO, .142 avg)...Right-handed batters are hitting just .198 (127-for-640) against Clevinger since the start of 2017, tied for second best in MLB among pitchers with at least 160 IP...Clevinger walked 127 of 1,312 batters (9.7%) since the start of 2017, fourth worst among qualified starters in MLB...His 27 assists were the second-most of any pitcher in the A.L....For the year batters hit .195 (55-for-282) off him with men on base, the sixth-lowest mark in the league. Had an outstanding season for the Indians, posting new career-highs in virtually every category, finishing fourth on the club with 12 wins and recording a B-R WAR of 3.2 ...His 3.11 ERA was the 8th-lowest ERA of any American League pitcher with at least 100.0 IP on the season while his .211 average against was 5th-lowest...Walked 4 of 11 batters faced in the ALDS vs. New York. In four starts during Cleveland's historic win streak (Aug. 24-Sept. 14), Clevinger went 4-0 with a 0.38 ERA (1ER/23.2 IP) and held the opposition to a .186 (16-for-86) average against...Over his last 5 starts, August 26-Sept. 19, he went 5-0 with a 0.61 ERA (29.2IP, 19H, 2ER, 10BB, 34S0, .184 avg) to lower his ERA from 3.97 to 3.13...5-game winning streak set a new career high. Following his final start at the LA Angels on Sept. 19 (W#11, 6.0IP, 3H, 1R/ER,2BB, 6SO), he made his last 3 appearances of the season out of the bullpen, Sept. 26-30 (3.2IP, 3H, 1ER, 4SO)...Overall on the year he posted an ERA as a starter of 2.84 (114.0IP, 84H, 36ER, .205 avg) and 7.04 (7.2IP, 8H, 6ER, 6BB, 11SO) in relief. 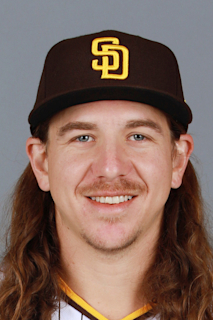 Had particular success against right-handed hitters, holding them to a .180 average (48/266), the second-best mark in the American League & fourth-lowest in MLB... Right-handed hitters batted just .133 (14/105) against Clevinger over his last 11 outings dating back to August 6...Struck out 28.3 percent of righties he's faced (87/307), as 87 of his 137 strikeouts were against right-handers. Worked a career-high 7.0 innings on May 20 at Houston with a then- career-high eight strikeouts...Struck out a career-high nine batters on June 27 vs. Texas, a total he would match on August 12 at Tampa Bay and August 26 vs. Kansas City.... Posted three straight, 6.0 IP scoreless starts, August 26-Sept. 8, becoming the first Indians pitcher since John Denny (3 CG SHO), August 28-Sept. 6, 1981, to post three straight scoreless starts of at least 6.0 IP...Recorded a least 6 strikeouts in each of his last five starts. Overall on the year he made 7 starts at AAA Columbus...At the time of his first recall (May 7), he ranked 5th in the International League in ERA...Overall spent three stints with the Indians (May 7-June 6; June 17; June 22-remainder) and made just one start in Columbus following May 7 on June 11 at Indianapolis...Overall on the year limited right-handed hitters to a .206 (13/63) average against as batters hit just .228 (28/123) overall and .107 (3/28) with RISP...Was named the International League (AAA) Pitcher of the Week for April 10-16 (2-0, 13IP, 7H, 0R, 17SO). Posted a 2.17 ERA (11ER/45.2IP) with Roberto Pérez behind the plate...Went 7-3 with 2.45 ERA in 12 road games/11 starts (62.1IP, 40H, 17ER, 69SO, 3HR)...Went 5-1 with a 0.99 ERA in 7 September games/4 starts (27.1IP, 18H, 3ER, 10BB, 29SO) and did not allow a home run over his last 32.2 IP...Batters hit .213 (37/174) with runners on base, .190 (16/84) with RISP and .143 (20/140) when behind in the count...Opponents hit .105 against (25/238) him as a starter with two strikes this season. Split the season between AAA Columbus and Cleveland, going 11-1 with a 3.00 ERA in 17 starts for Columbus and appearing in his first 17 Major League games throughout the season ... At the time of his final August 4 recall from Columbus he ranked tied for first among International League pitchers in wins (11), 7th in ERA (3.00) and 8th in strikeouts (97)...Limited Triple-A left-handed batters to a .201 (36-179) average against and has yielded a mark of .187 (26-139) with runners on base...Started the year 9-0 for the Clippers and did not lose his first game until July 18 (15th start)... Pitched a scoreless inning in the Triple-A All-Star Game.Spent three stints with the Indians at the Major League level (5/18-6/1; 7/4-6; 8/4-remainder) and made his Major League debut on May 18 at Cincinnati (ND, 5.1IP, 5H, 4R/ER, 1BB, 5SO, HR)...First career strike out was Joey Votto in the first inning...Made 3 starts during his first stint (0-1, 8.79 ERA, 14ER/14.1IP) before being shipped back to Columbus on June 2...Recalled on July 5 for bullpen help following the 19.0IP game in Toronto on July 1...Recalled on August 4 for the remainder of the season and notched his first Major League win on August 13 vs. the team that drafted him, the Los Angeles Angels (5.2IP, 1H, 1R/ER, 4BB, 3SO, hitless first 5.2IP)...Pitched in a relief role from August 18-28 before entering the rotation again on Sept. 5 due to Josh Tomlin ineffectiveness and Danny Salazar's arm injury...Overall in relief his ERA was 3.00 in 7 appearances (12.0IP, 8H, 4R/ER, 5BB, 14SO, .182 avg)...In Sept/ Oct he went 1-2 with a 5.19 ERA in 5 starts/6 games (17.1IP, 18H, 10ER) after being re-inserted back into the roation after injuries to Danny Salazar and Carlos Carrasco...Won in relief in the penultimate game of the season on Oct. 1 at KC...ERA as a starter was 5.93 on the year at the Major League level (41.0IP, 42H, 27ER)...Worked 2.0-or-more innings in three of his seven relief appearances, including 4.0 innings on August 18 vs. Chicago-AL (2H, 1ER, 1BB, 4K)...ERA in Progressive Field was 3.54 (11ER/28.0IP) compared to 7.20 (20ER/25.0IP) away from home...Major League hitters batted .246 (52-203, 8HR), including a mark of .178 (16-90, 1 homer) against left-handed batters (.505 OPS compared to a .976 OPS/7HR allowed to RHB)...Struck out 8.5 per 9.0IP but also walked 4.9 per 9.0IP. Named Tribe's organizational Pitcher of the Year...Had a breakout season, going 9-8 with a 2.73 ERA in 27 games/26 starts with Akron, tallying the 3rd-most strikeouts, the second-lowest WHIP and the 4th-lowest average against in all of Double-A ball (158.0IP, 127H, 53R/48ER, 8HR, 9HB, 40BB, 145SO, .219 AVG, 1.06 WHIP), also the most strikeouts and 2nd-lowest ERA in the Indians system while finishing up in the top 5 of the EL in ERA (5th), strikeouts (2nd) and WHIP (2nd)...Worked at least 5.0 innings in all but two starts and didn't allow more than 4 runs in a game all season. The Jacksonville, Florida native was promoted to Columbus for postseason play and proceeded to go 2-0 with 15.1 scoreless innings over 2 starts...Worked 7.2 hitless innings in his first Triple-A start against Norfolk in game 1 of the Governors' Cup semifinals on Sept. 14 (7.2IP, 0H, 2BB, 10SO) and followed up that performance with 7.2 scoreless innings in game 5 of the Governors' Cup finals to secure the championship for Columbus in a 3-0 win at Indianapolis on Sept. 19 (7.2IP, 5H, 1BB, 7SO). Over his last 6 regular season outings in Akron after August 5 he posted an ERA of 1.40 (38.2IP, 23H, 6ER, 40SO)...On the year allowed just 8 homers in 158.0IP (.45/9.0IP)... For the year lefties hit .225 off him, RHH hit .214, batters hit.206 with runners on and .194 with RISP...Entered season with a Minor League career ERA of 4.36. Assigned to A Carolina following 9/7 trade...Combined on the year he went 4-4 w/a 5.24 ERA in 23 games/22 starts (99.2IP, 94H, 49ER, 43BB, 100K). Debuted in August after rehabbing from reconstructive right elbow surgery the previous year (made last start of 2012 on 5/21)...Was LA Angels #4 organizational prospect according to Baseball America. April 9, 2019 Cleveland Indians placed RHP Mike Clevinger on the 60-day injured list. Right upper back/Teres major muscle strain. June 22, 2017 Cleveland Indians recalled RHP Mike Clevinger from Columbus Clippers. June 18, 2017 Cleveland Indians optioned RHP Mike Clevinger to Columbus Clippers. June 17, 2017 Cleveland Indians recalled Mike Clevinger from Columbus Clippers. June 7, 2017 Cleveland Indians optioned RHP Mike Clevinger to Columbus Clippers. May 7, 2017 Cleveland Indians recalled Mike Clevinger from Columbus Clippers. March 26, 2017 Cleveland Indians optioned RHP Mike Clevinger to Columbus Clippers. August 4, 2016 Cleveland Indians recalled RHP Mike Clevinger from Columbus Clippers. July 7, 2016 Cleveland Indians optioned RHP Mike Clevinger to Columbus Clippers. July 4, 2016 Cleveland Indians recalled Mike Clevinger from Columbus Clippers. June 2, 2016 Cleveland Indians optioned RHP Mike Clevinger to Columbus Clippers. May 18, 2016 Cleveland Indians recalled Mike Clevinger from Columbus Clippers. March 14, 2016 Cleveland Indians optioned RHP Mike Clevinger to Columbus Clippers. November 20, 2015 Cleveland Indians selected the contract of Mike Clevinger from Columbus Clippers. September 25, 2015 Columbus Clippers activated RHP Mike Clevinger. September 22, 2015 Columbus Clippers placed RHP Mike Clevinger on the reserve list. September 9, 2015 RHP Mike Clevinger assigned to Columbus Clippers from Akron RubberDucks. April 3, 2015 RHP Mike Clevinger assigned to Akron RubberDucks from Lynchburg Hillcats. August 10, 2014 Mike Clevinger roster status changed by Carolina Mudcats. August 8, 2014 RHP Mike Clevinger assigned to Carolina Mudcats. July 8, 2014 Inland Empire 66ers activated RHP Mike Clevinger from the 7-day disabled list. June 26, 2014 Inland Empire 66ers placed RHP Mike Clevinger on the 7-day disabled list retroactive to June 22, 2014. June 13, 2014 Inland Empire 66ers activated RHP Mike Clevinger from the 7-day disabled list. June 5, 2014 Inland Empire 66ers placed RHP Michael Clevinger on the 7-day disabled list retroactive to May 29, 2014. May 5, 2014 RHP Michael Clevinger assigned to Inland Empire 66ers from Burlington Bees. September 21, 2013 Burlington Bees activated RHP Michael Clevinger from the 7-day disabled list. August 31, 2013 RHP Michael Clevinger assigned to Orem Owlz from AZL Angels. August 22, 2013 Michael Clevinger roster status changed by AZL Angels. June 20, 2013 Michael Clevinger roster status changed by AZL Angels. April 1, 2013 Burlington Bees placed RHP Michael Clevinger on the 7-day disabled list. July 1, 2012 sent RHP Michael Clevinger on a rehab assignment to AZL Angels. May 27, 2012 Cedar Rapids Kernels placed RHP Michael Clevinger on the 7-day disabled list. April 2, 2012 RHP Michael Clevinger assigned to Cedar Rapids Kernels. September 5, 2011 RHP Michael Clevinger assigned to AZL Angels from Orem Owlz. August 15, 2011 Michael Clevinger assigned to Orem Owlz from Los Angeles Angels. August 14, 2011 Los Angeles Angels signed Mike Clevinger.